Raghu Garud is Associate Professor of Management and Organizational Behavior at Leonard N. Stern School of Business, New York University. Besides authoring many articles on modularity that have been published in leading management journals, Raghu has co-edited and co-authored several books, including Path Dependence and Creation (2001), The Innovation Journey (1999), and Technological Innovation: Oversights and Foresights (1997). He was Program Chair for the Technology and Innovation Management Division for the 2001 Academy of Management meetings. Arun Kumaraswamy is Assistant Professor of Management at the School of Business – Camden, Rutgers University. He has published several papers on modularity and standards in journals such as the Academy of Management Journal and the Strategic Management Journal. Richard N. Langlois is Professor of Economics at the University of Connecticut. He is the author of numerous articles and books, including Firms, Markets, and Economic Change: A Dynamic Theory of Business Institutions (1995). His history of the microcomputer industry won the Newcomen Award as the best article in Business History Review in 1992. 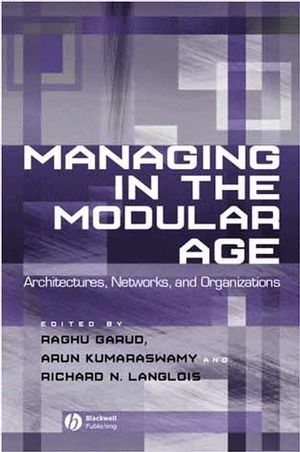 Introduction: Managing in The Modular Age: Architectures, Networks and Organizations. (R. Garud, A. Kumaraswamy, R. Langlois). 1. The Architecture of Complexity. (H. A. Simon). Commentary. (M. Augier and H. A. Simon). 2. Technological and Organizational Designs to Achieve Economies of Substitution. (R. Garud and A. Kumaraswamy). 3. Networks And Innovation In A Modular System: Lessons From The Microcomputer And Stereo Component Industries. (R. N. Langlois and P. L. Robertson). Part II: Modularity And Architectures. 4. The Role of Product Architecture in the Manufacturing Firm. (K. Ulrich). 5. Managing in an Age of Modularity. (C. Y. Baldwin and K. B. Clark). 6. Towards a General Modular Systems Theory and Its Application to Interfirm Product Modularity. (M. A. Schilling). Part III: Networks And Standards. 7. The Economics of Networks. (N. Economides). 8. The Art of Standards Wars. (C. Shapiro and H. R. Varian). Part IV: Field-Level And Organizational Dynamics. 9. Dynamics of Organizational Communities and Technological Bandwagons: An Empirical Investigation of Community Evolution in the Microprocessor Market. (J. Wade). 10. Dominant Designs, Technological Cycles and Organizational Outcomes. (M. L. Tushman and J. P. Murmann). Commentary. (G. Westerman and M. L. Tushman). 11. Modularity, Flexibility and Knowledge Management in Product and Organizational Design. (R. Sanchez and J. T. Mahoney). Includes contributions from leading scholars of technology and organization.